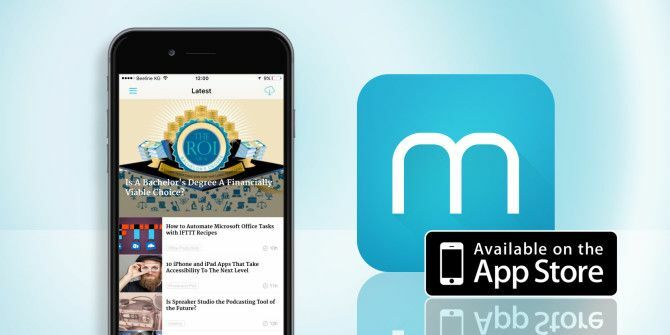 Back in September, we announced a brand new smartphone app that made browsing MakeUseOf on your iPhone Read MakeUseOf on Your iPhone With Our Brand New App, And Win an iPhone 6s (Updated) Read MakeUseOf on Your iPhone With Our Brand New App, And Win an iPhone 6s (Updated) MakeUseOf's iPhone app is here and with it you can browse, chat and save your favourite articles, all from the comfort of a native smartphone app. Read More a more pleasant experience than ever before. Since then we’ve been hard at work implementing some of your most-requested features. We love the iPhone, but mobile browsers aren’t always the nicest of reading companions. That’s why we’ve built and continue to work on our MakeUseOf app for iPhone (and Android too!) — here’s what we’ve been up to since the app’s introduction. The ability to customize MakeUseOf and make it your own was one of the biggest changes we introduced last year, a feature we implemented in the form of subscriptions and bookmarks. On our iPhone app, push notifications sound each time one of your preferred sections is updated. Many of you will have already signed up with your email, a Facebook account, or Google account in order to make the most of this feature on our homepage, and now you can use those same login credentials to automatically sync your favourite content with the iPhone app. This includes your subscriptions and articles you have saved for later using the bookmark icon. This makes browsing MakeUseOf on a smartphone or standard web browser a seamless experience — if you find something useful for your Mac or Windows PC on your morning commute, you can bookmark it on your phone and put it to full use when you get home later simply by checking the My Bookmarks section in your web browser. If you’d rather just use the iPhone app without logging in, that’s fine too — and you’ll still get push notifications when your favorite sections receive new posts; but you’ll lose out on the ability to sync bookmarks automatically. Not everyone has Internet at all times, and some of us are on strict cellular plans that charge an arm and a leg for data (here are a few suggestions if that sounds like you The 10 Cheapest Mobile Phone Plans in the US Right Now [Cheat Sheet Included] The 10 Cheapest Mobile Phone Plans in the US Right Now [Cheat Sheet Included] There are plenty of cheap mobile phone plans available if you know where to look. Read More ). If you’d rather download articles for perusal wherever and whenever, you can now do so by hitting the “cloud” icon in the top-right corner of the MakeUseOf app. This will download the latest 10 articles to your iPhone, and make them available for reading anywhere. Any articles you save as bookmarks are will also be made available offline — so you can use the feature as an impromptu reading list if you really want! To save an article for later from the main menu, simply swipe left-to-right and choose Save. You’ll find the article in your bookmarks section of the main menu, in the bottom-left corner of the screen. We’ve also tightened a few nuts and bolts and made browsing an overall smoother experience, applying some UI polish for faster browsing. You can now swipe left-to-right on items in the main list view to save them as bookmarks and share directly to Messages, Mail, and your favorite social media and bookmarking apps via the More menu. A new font and full-width images make for a more readable article view, retaining the ability to modify the size of on-screen text to suit your own preferences. We’ve also added an in-app browser for previewing links, complete with the option of opening links in Safari or Chrome — if that’s your thing. To change default browser, open the main menu and tap on the settings cog at the bottom of the screen. If you have a burning tech question to ask other fellow MakeUseOf readers and even our editors, dive into the MakeUseOf Groups found under the Chats tab. Powered by the topical always-on messenger, Grouvi Grouvi Is the New WhatsApp for Topic-Based Chats [iPhone 6 Giveaway] Grouvi Is the New WhatsApp for Topic-Based Chats [iPhone 6 Giveaway] Grouvi brings people with common interests together using a simple mobile app, and we think the potential is massive. Read More , our community is actively growing, and is a great place for geeks and tech enthusiasts to hang out. We think that browsing MakeUseOf on your personal device makes for a much nicer experience using a purpose-built app, and we hope you will too. Download MakeUseOf for iPhone free today and let us know what you think! If there are any other features you’d love to see, don’t forget to drop them in the comments below. We’re working hard on providing a stable and useful iOS app, and reader feedback is an incredibly important part of making that vision a success.